Catamaran Life: Double the Pleasure (and Work): Cats are twice as comfortable as monohulls, no doubt. It can be argued that they’re safer, faster, and more fun. 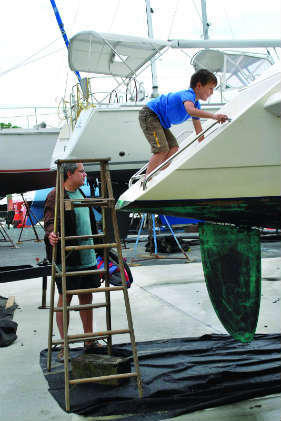 But with all that comes double the work when taking care of catamarans. 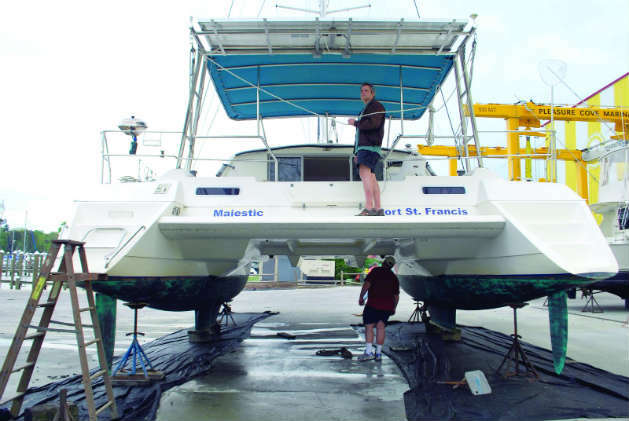 From the bottom up, hauling out and bottom work on a multihull is no easy task. 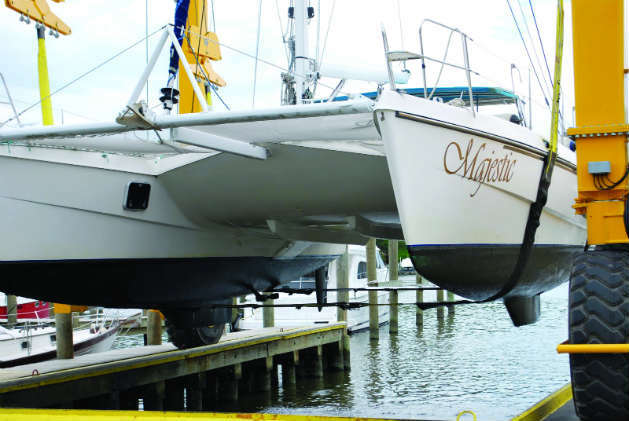 Finding a yard that has a Travel Lift for wide-beamed cats is a challenge on the Chesapeake Bay. You can count the yards that can haul cats on your fingers and still have enough left over to grab a drink. Get on the schedule early, especially in the busy season. Once your cat is high and dry, it’s time to do all the dirty work, only times two. Twice the scraping, twice the sanding, and twice the painting. If you’re a DIY’er and over age 40, you’ll want to take a preventative ibuprofen and book a massage before you start the work. 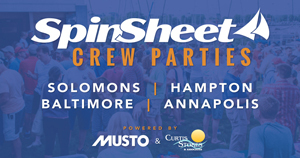 If you’re hiring out the work, expect the cost to be noticeably more than the same job on an equal-sized monohull. The upside is that if you’re somewhere with predictable tides and a nice sandy bottom, multihulls can be beached on purpose to do work yourself. 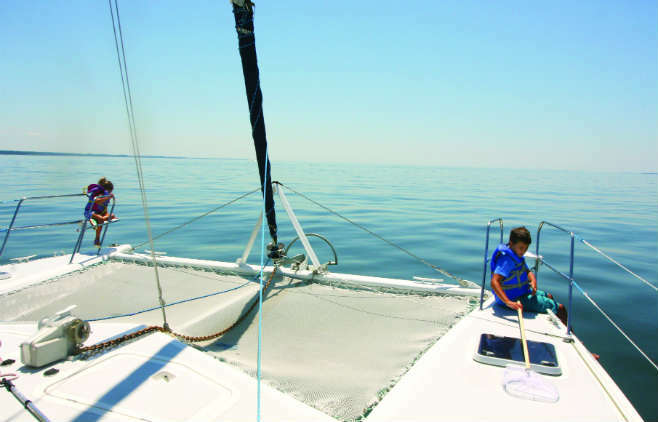 Owners can scrub bottoms, change out zincs, and perform a number of normally below-the-waterline jobs with a carefully timed beaching. If you find yourself accidentally beached, “okay fine” aground, you’re still not in dire straits as on a monohull. My husband and I have ended up aground a handful of times for various reasons, and we sat lovely and level until we were able to sort things out. Regular boat bath day is also twice the chore. Those fabulous wide, flat decks are a lot of real estate to keep clean. You have to buy double the soap and wax to keep her shiny. And after all of the entertaining that happens in the huge cockpit of a cat, that’s just one more room that needs cleaning and scrubbing. Our cruising, liveaboard catamaran came with four cabins and four heads. Four heads means four toilets to clean, unclog, and maintain. No, thank you. We made the choice to tear out the two smaller heads and transform those spaces into something more useful for our family. One became a pantry and boat school space; the other turned into a play area for my daughter we call “the girl cave.” It was a way for us to cut down on the stinky work and make the boat meet our needs. One of the problems with all that space on a typical cruising cat is that people have a tendency to fill the space they have. Cats are not built to carry heavy loads the way monohulls can. It impacts sailing performance and offshore ability. Not only should cats be kept relatively light, but it also helps to balance the weight you carry and to keep the loads evenly distributed fore and aft, starboard and port. Two engines are a curse and a blessing on a cruising cat. Of course there are twice the oil changes, twice the spare parts to carry, and twice as much time doing acrobatics to work on the engine. Some cats have really great all-around access to the diesel, and others require you to bungee a well-trained three-year-old into the space for regular maintenance. Whatever the access situation is, the upside to dual engines makes it all worthwhile. Our cat cruises along comfortably at eight knots without even running the engines very hard. We can push through countercurrents and use our twin screws to maneuver in and out of tight spaces. The best part about two engines is the redundancy. If one decides not to work, we can press on. My husband and I have traveled hundreds of miles with one dead engine. On our old cat which had twin retractable outboards rather than diesels, we once found ourselves with two dead outboards (victims of bad fuel in the islands), and we were able to go the next few hundred windless miles with our dinghy engine pushing us along to a place where we could make repairs. FIND PART ONE OF THIS SERIES HERE... AND PART TWO HERE.... AND PART THREE HERE.